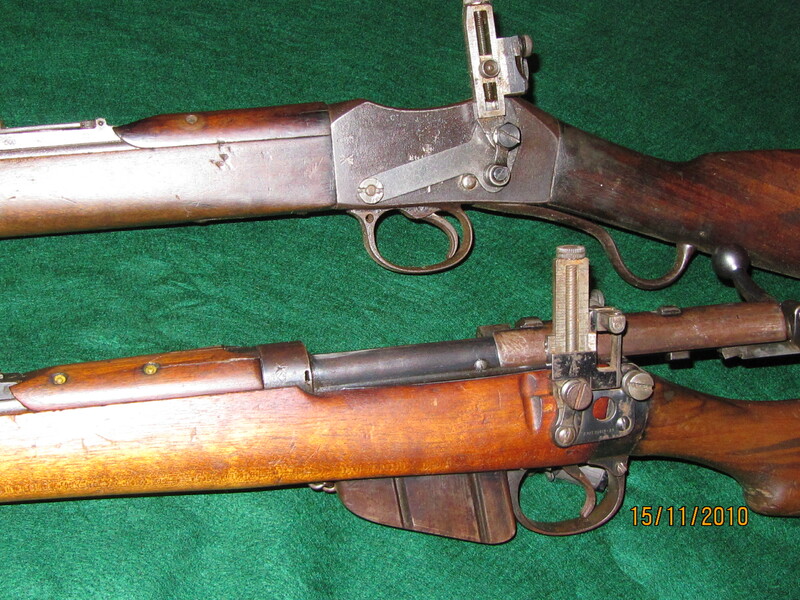 Part of collecting old rifles must surely be the pleasure of shooting those that are over 100 years since manufacture. My oldest "working rifle" is an 1870 - .577 Snider, a Swedish rolling block 12.7x44mm, 1876 Alex Henry 577/450 and even the old 1900 BSA 303 gets a lot of use with cast boolits. Thanks for sharing the pictures!! You've got some oldies, but goodies as they say. I think my oldest is an 1894 Krag. 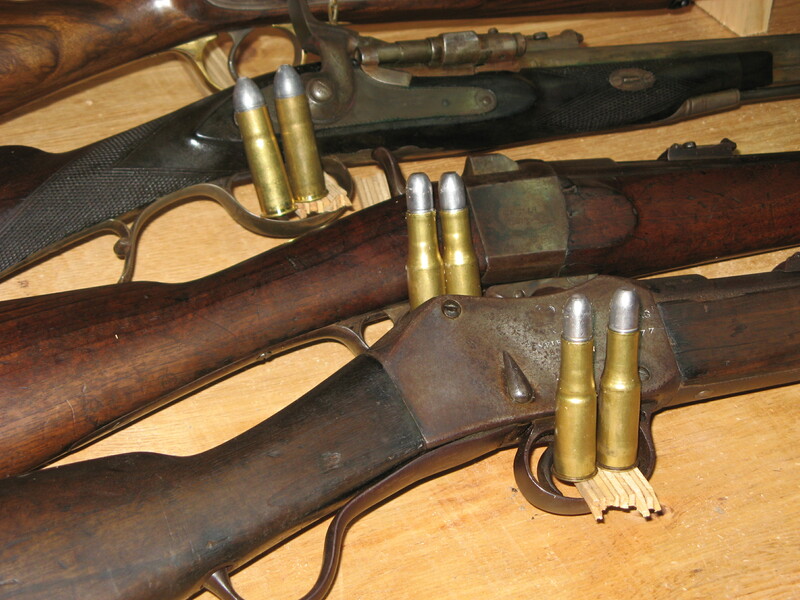 I have 2 replicas of 1873 Winchesters, but that's not the same thing as shooting the real deal. Very nice. Drool worthy. Thanks for sharing. Got a sporterized 1896 MLE and LEC, always wanted a Martini in 303. Those are some nice vintage rifles to go and shoot from time to time. My oldest is probably my .43 Egyptian Rolling block rifle. But I need to fix the buttstock before I think about shooting it. My other oldie is a 1888 Gewehr rifle made in 1893. It has the S stamp mark so it would work with standard low power 8x57mm Mauser ammunition. Then I have a 8x60R Kropatschek rifle which was made in 1886. It is shootable, but I haven't made any ammo for it yet. My Japanese Type 30 Training rifle was converted from a regular one, so it might count as a oldie now too, since they were made before 1900 too. 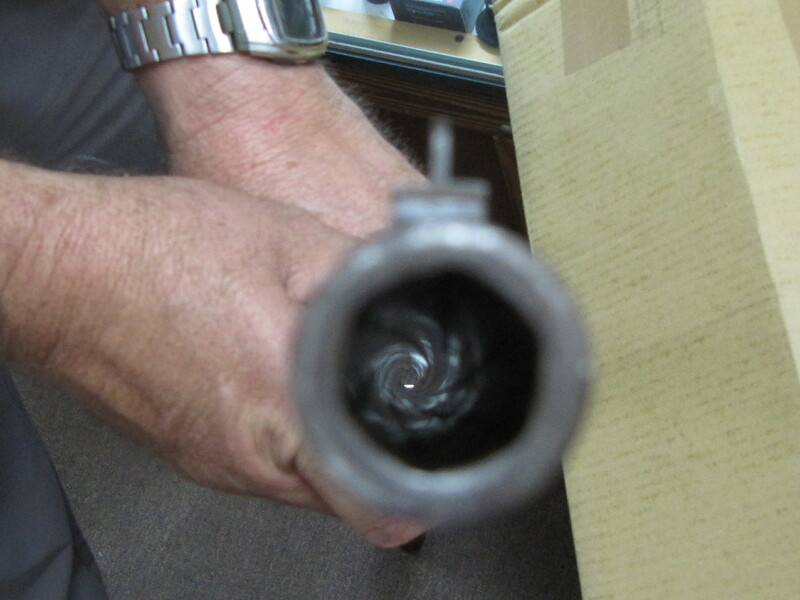 B.A.W....do you know if a NSW Henry has the same barrel thread as a Martini-Henry?I was thinking of sleeving the chamber,as I dont like the exposed case base with CBC cases.,but it would be better to sleeve a spare barrel,rather than the original....which has been shortened and rechambered anyway. I suspect they are the same V14 profile, but the shank on the Martini .0.700 long while the Alex Henry is only 0.617 long. Your in Brisbane, I have both 577 Snider and 577/450 reamers and headspace gauges. What is astounding is that some designs are still worthy of being replicated today. My slickest lever action is an Uberti 1873.
very nice. I love that falling block rifle! 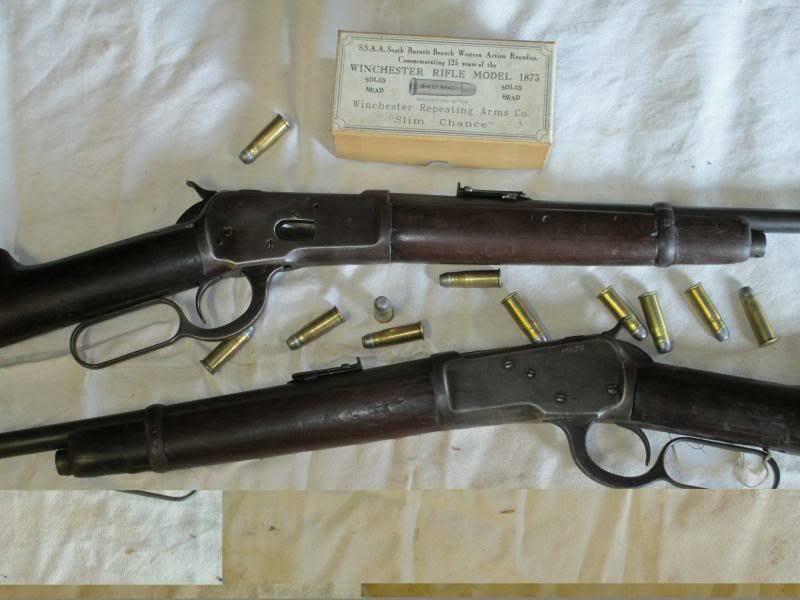 Here is another couple, 1892 Winchesters (made in 1892) in 38/40. While not strictly military rifles, these were special order for the state prison service and to my suprise 126 y/o rifles with conseqetive 4 digit serial numbers! My SMLE MkIII (no bloody *) is a 1915 Enfield made. Guess its in the Century club now. I've had the opportunity to shoot .50-70 out of both trapdoors and rolling blocks, which I regarded a highly cool because it's one of those "Dawn of the Metallic Cartridge" rounds that's worthy of black space monoliths, thighbone-weilding chimpanzees, and a playing of Also Sprach Zarathustra. Paul Freeman's line from Raiders of the Lost Ark - "We are simply passing through history. THIS IS HISTORY" - is in my mind a lot when I play with this stuff. What I DON'T get is why the Italian firms aren't replicating the Martini Henry, which has every bit the storied past as anything that every came out of Winchester. My oldest working rifle is an 1861 Snider Enfield. I also have an 1874 Martini-Henry, 1886 Lebel and 1899 Krag Jorgensen. The MH requires a complete cleaning after a shooting session so that does not get shot too much. The Snider is fun to shoot. 62.5 grains FFFG is a pleasant round. Not sure when my SMLE was made but it is fun to shoot too. Have a .30-06 M1903 made in 1910 that gets fired every so often. I just love the old wood and steel. My oldest rifle is a very nice Trapdoor. I like everything about it except the horrendous trigger pull. I love that Snider and have wanted one ever since I read an article about hunting in Africa where the hunter borrowed a Snider for use on some of the bigger game. I must have read that article about 50 years ago and still want a commercial sporter version of a Snider. If the Italians would make a Snider or Martini I would buy either. I probably read that same article. The author's sporting rifle was damaged somehow so he borrowed the Snider. The Snider had been re-chambered for a much longer and more powerful sporting cartridge of the same bore diameter. A couple of my favorites that are nearly 150 years old. 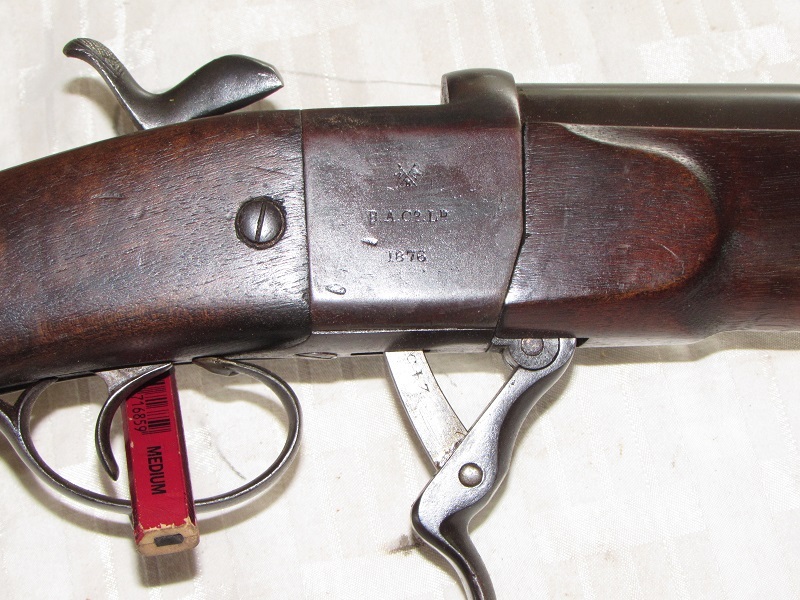 A very early Remington rolling block Transformed rifle chambered in .58 Roberts. The other a US model 1871 Springfield Spencer. Both shoot surprisingly well. Seeing the guns that have been posted have made my finger itch! All are very fine rifles that look to bring a smile with every trigger pull.